When you visit an art museum, do you notice the frames? They are always carefully selected to complement the style of the artwork. You may see grand paintings framed with intricately carved, gold-accented wood, or simpler paintings framed in old barn wood. 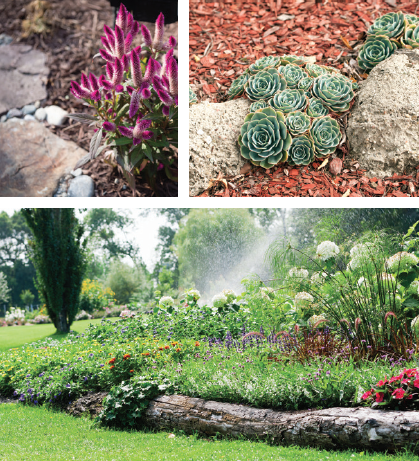 It’s the same for your landscaping—your own living, growing work of art. And it deserves a proper border, so we have compiled some ideas to help you frame your “masterpieces” this spring. 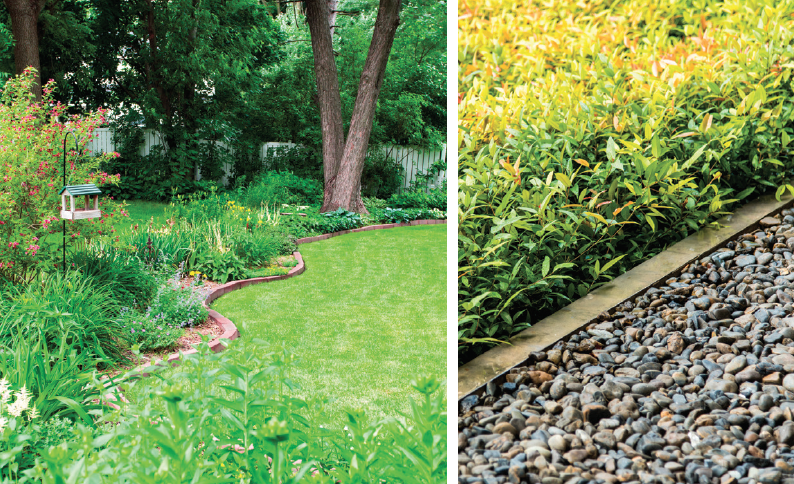 Options for garden edging have come a long way from the black, plastic border strips and landscape timbers. Now you can shop for a variety of bricks, pavers, stone, gravel, and faux styles of all the above that do a very good job of mimicking the real thing. Then, you can create a custom border by combining any of a number of materials. 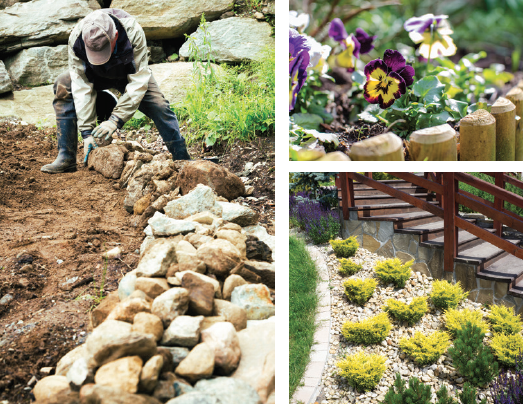 Maybe you are just used to raking the mulch back regularly or using an edger and trimmer to keep your landscaping tidy, but adding permanent garden edging could actually make those jobs less frequent, or even unnecessary. Bricks and pavers may be the most traditional material, and undoubtedly the most affordable, of any hardscape border, but you can use them in many different ways. It can be as easy as lining up bricks on their long sides and embedding them about an inch into the ground, then laying rows of bricks flat up against the standing bricks, creating a level surface. This extends the border and, if done correctly (by using landscape fabric and a sand base), a lawn mower wheel should have no problem rolling right over it. This design also allows for plants to beautifully cascade over the edge without reaching the grass. You can add variety to this look and use a different colored brick for the inner edge and another color of paver for the outer edge. Consider the color of the mulch in your design as well; perhaps you want to pick a white or light-colored paver to contrast with black mulch. If you don’t want to use bricks for the inner edge, consider adding a thick layer of pebbles instead. You can also stack bricks diagonally, buried halfway in the ground, to create a diamond-shaped border, then go a step further by laying a row of gravel or small stones on the outside. In sticking with the traditional, those bendable, fabricated borders still exist, but they’re more durable and more attractive than they were even a decade ago. People still choose them for their affordability (especially if you have a large garden space) and their ease to install (no digging required). Even the rolls of plastic edging come in different colors now and have been designed with stakes to firmly hold them in place. 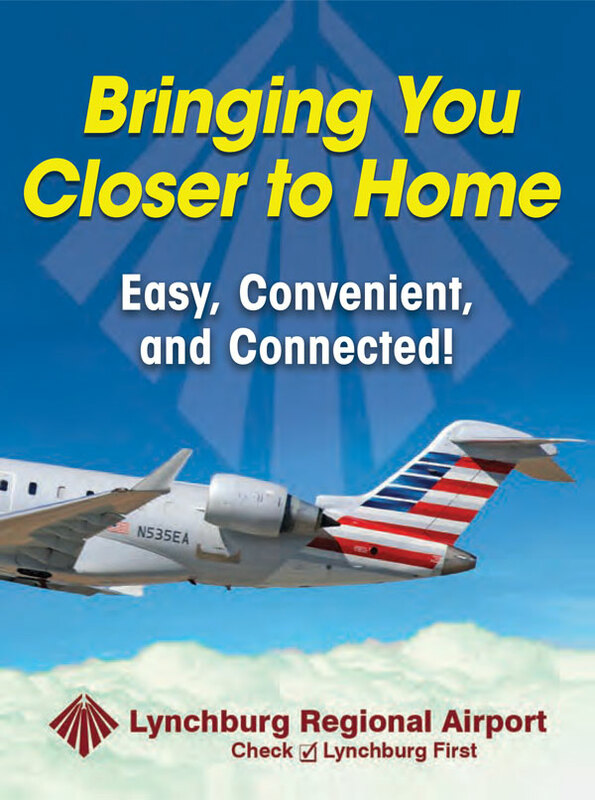 You can also find metal edgings, made of aluminum or steel, and coated in different colors. The metal is effective in fending off grass, but it is not recommended that you use it in an area where people may be walking. Some of these products can be installed to form raised beds and others can be installed to a lower height that is safe for your mower. There are also an astounding number of products available that can play tricks on our eyes. Home and garden stores now carry so many options of stone- and brick-looking borders made entirely of plastic or resin. Easy to transport (to borrow the common but apt phrase, the job no longer hits you like a ton of bricks), the products have been designed with just the right texture and color to give the appearance of the real thing. 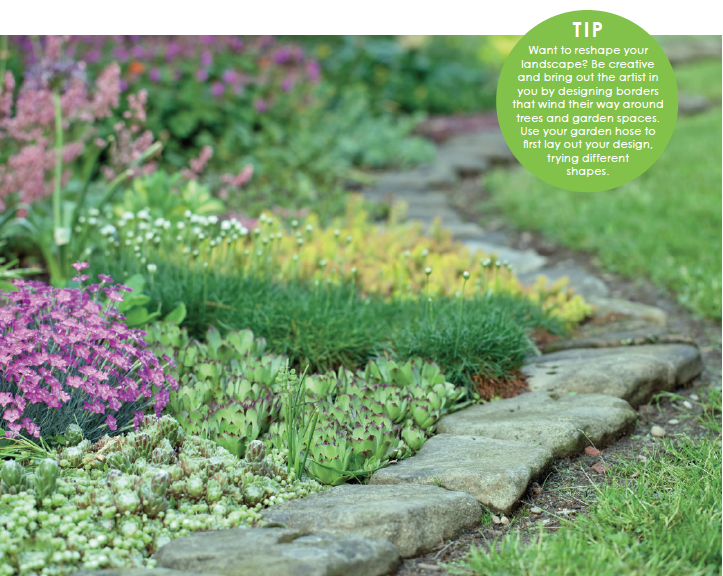 If you want your garden edging to look as natural as possible, there are many ideas you won’t find on a shelf. Consider collecting and using river rocks to edge your garden beds, or split logs, halved lengthwise, and placed with the bark facing up. Do you like to bring back souvenirs from the beach? You can use pieces of driftwood or oyster shells in your garden borders. To go for a more primitive look, use a series of stick posts, then stack long sticks woven between them, much like the fences of colonial days. A popular edging design that uses a mix of the natural and a bit of the manmade is the gabion. A cage-like wire container holds rocks or crushed stone and can be built between fence posts. Although there are suppliers of these containers, you can make your own with concrete remesh bought from your local home improvement store. And who says you can’t make a garden border with plants themselves? A row of potted plants buried slightly in the ground will create a firm but natural border. Plants that won’t wander away too far from the pots are best; consider rosemary, thyme, or ornamental grasses. No matter the style of your garden border, think of it as the frame that highlights an important piece of art, holding everything in place and showcasing your hard work. Bring the art of gardening to life by designing your own borders that will help to usher in spring.